Shaiha's Ramblings: Oh where did the hours go? Oh where did the hours go? I just had four days off and I am sitting here at work wondering just where those days actually went. I did manage to accomplish quite a bit but it sure seems that by way too fast. I am not quite sure why time seems to speed up as I get older. Come to think of it, why is it that when we get older, we no longer get summer vacations. It seems backwards as I didn't need the summer off to recuperate when I was younger but it sure would be nice now. Oh and I decided that since I hadn't posted any pics of my furkids lately, I had better change that. 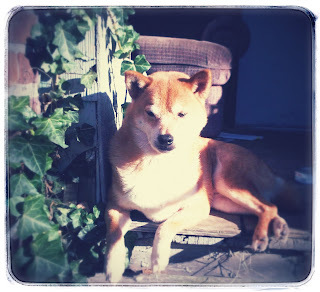 I took that pic of Kitsune on Monday. He sure is a strange dog. His favorite thing in the world is to sit on the porch and watch the world go by. It has been commented upon that I don't have any cat pics up. I will have to fix that :) Thanks for stopping by. Where did all energy go? ?